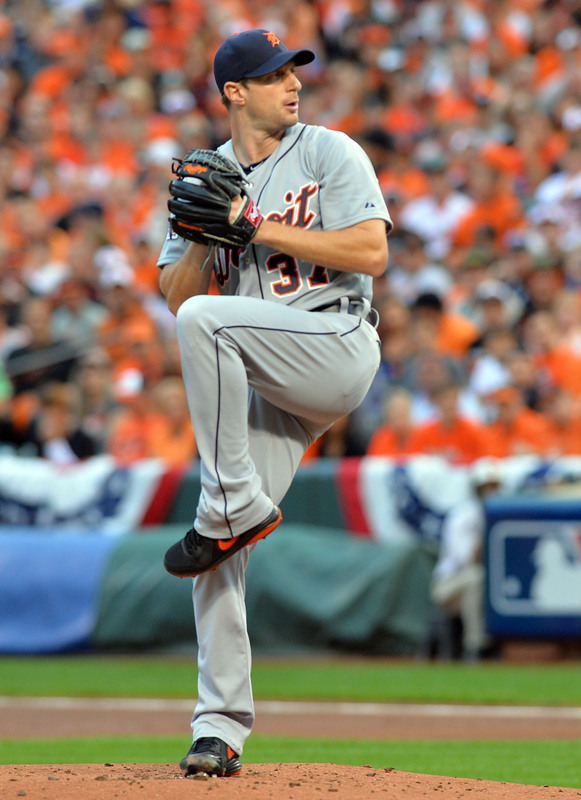 2013 Cy Young award winner Max Scherzer is the prize of the free agent market after another superb season. He’s a strikeout machine with a strong record of durability, and agent Scott Boras will be seeking a precedent-setting contract. Scherzer, 30, posted a 3.02 ERA over 434 2/3 regular season innings from 2013-14. In 2013, he went 21-3 with a 2.90 ERA and 240 strikeouts for the Tigers and won the AL Cy Young award easily. He made the All-Star team in both years. Scherzer has been one of the game’s most dominant starting pitchers since 2012. He has a 10.5 K/9 over that period, second among qualified starters in all of baseball. His ranking is the same in K%; he’s whiffed 28.6% of batters faced during that time. He’s tallied 231 or more strikeouts in each of the past three seasons and leads all of baseball with 723 punchouts over that time. Scherzer also has good control, with a 2.5 BB/9 over the past two seasons. He uses a four-seam fastball and a change-up, also employing a slider against righties and a curveball against lefties. Batters made contact on only 74.5% of Scherzer’s pitches from 2012-14, third best in baseball among qualified starters. Batters swung and missed on 11.9% of Scherzer’s pitches, which ranked fourth. Skill-Interactive ERA (SIERA) is the latest ERA estimator, from Matt Swartz. Scherzer’s 2.94 SIERA ranks eighth among qualified starters over the last two seasons. His actual ERA of 3.02 is in line with that, and ranks 11th. How about durability? Scherzer hasn’t been on the disabled list since a short stint in 2009. Even that year he made 30 starts, a number he exceeded in every subsequent season. His 434 2/3 innings from 2013-14 ranks sixth in baseball, and he tossed another 29 2/3 frames in the postseason. Still, Boras has pointed out that Scherzer has less wear and tear on his arm than Jon Lester and James Shields. This is mainly because Lester and Shields signed early-career extensions giving up free agent years, and Scherzer did not. Put it all together, and Scherzer is an ace, one of the best pitchers in the game. He’s tallied 12.0 wins above replacement over the last two seasons, tied with Felix Hernandez for second in MLB. Clayton Kershaw is the best, but Scherzer is in the conversation for second-best. Scherzer is decidedly a flyball pitcher. This hasn’t hurt him over the last two seasons, as he’s allowed 0.75 home runs per nine innings. From 2011-12, however, he allowed 1.22 HR/9. The difference seems like nothing more than the vagaries of his home run per flyball rate, which has hovered around 7.5% over the past two seasons. Across MLB this year, 9.5% of flyballs left the yard. Applying that rate, Scherzer would have allowed 4.7 additional home runs this year and posted a 0.93 HR/9. Simply put: it would not be surprising if Scherzer is slightly below average at preventing home runs during his next contract. Pitch efficiency is not a strong suit for Scherzer. He averaged 16.51 pitches per inning in 2014, 70th among 88 qualified starters. The average qualified starter was at 15.77 pitches per inning. Scherzer threw 3,638 pitches in 2014, third-most in baseball. As a player who received and will turn down a qualifying offer, signing Scherzer will require forfeiture of a draft pick. Jon Lester, who is Scherzer’s biggest competition on the market, is not eligible for a qualifying offer. Scherzer was born in St. Louis, Missouri. He attended high school in Chesterfield, MO, rooting for the Cardinals as a child. His dad even brought him to Game 4 of the 1985 World Series when he was 15 months old, according to this article from Jeff Passan. Scherzer was drafted by the Cardinals in the 43rd round in ’03. He chose not to sign and attended University of Missouri Columbia, getting drafted 11th overall by the Diamondbacks in ’06. Scherzer majored in business at Mizzou. Scherzer currently resides in Scottsdale, Arizona with his wife. His charitable efforts are extensive, with his Scherzer’s Superstars program and other efforts. C.C. Sabathia’s seven-year, $161MM contract from six years ago remarkably still stands as the largest given to a starting pitcher on the open market (though the Yankees’ total outlay for Masahiro Tanaka last winter was $175MM, including a $20MM fee paid to his former team in Japan). In 2008, the average American League starting pitcher had a 4.48 ERA. Sabathia was on an island in the 2008-09 offseason, coming off a 2.70 ERA. Scherzer is not on an island. In 2014, the average AL starter had a 3.92 ERA. As ESPN’s Buster Olney explained, “Major League Baseball’s market has never seen so much attractive pitching available all at once, although executives throughout the sport are aware this shift is something of an optical illusion, created by the historic drop in run production in recent seasons.” Scherzer’s 3.15 ERA this year ranked 26th among qualified starters. That would have ranked 12th in 2008. In ’08, 23 starters were under 3.50. In 2014, 39 starters were under 3.50, including free agents Jason Hammel, Francisco Liriano, James Shields, Edinson Volquez, and Jon Lester. Maybe Boras can make a strong case that Scherzer is the second-best starting pitcher in baseball, but the scarcity isn’t there in baseball or in free agency. Free agency is rife with solid mid-rotation options this year, and teams ready to spend big on pitching might prefer Lester because he might not require a seventh year. Or maybe teams would rather take on Brandon McCarthy’s injury risk at half of Scherzer’s average annual value and potentially as few as three years. I expect Boras to seek more than $175MM for Scherzer. That kind of commitment limits a player’s suitors. As Heyman put it, “It almost seems like Scherzer is too good for the market at times.” In batting around potential fits with MLBTR’s writing team and others around the game, teams like the Cubs, Red Sox, Yankees, Dodgers, Astros, Giants, Rangers, Blue Jays, Mariners, White Sox, Orioles, Nationals, and Diamondbacks came up. Some of those clubs don’t seem to have the payroll space, others don’t seem to be prioritizing starting pitching, and others have suggested they won’t play at the top end of the market. Scherzer’s old team, the Tigers, can’t be ruled out yet. Keep in mind that “this is an owner’s decision,” as Boras put it, as it will happen above the GM level. It stands to reason that Boras will want the seven year term achieved by Tanaka and Sabathia. Tanaka’s deal began with his age 25 season, Sabathia’s with his age 28 campaign. Scherzer’s deal will begin with his age 30 campaign, so he’s got a tougher case, one he’ll make with the “less wear-and-tear” argument. And don’t be surprised if we hear about Boras asking for eight years, as a way of arriving at seven in the end. For average annual value, the $30.7MM figure obtained by Kershaw is likely out of reach, though Boras may make the argument that Kershaw’s six free agent seasons cost more like $32MM per year. Greinke was at $24.5MM, Tanaka at $25MM. Felix Hernandez and Justin Verlander were at $27-28MM per year, but those extensions were not signed on the open market and only added five additional years. Ten MLB contracts have included opt-out clauses, and Boras did four of them. The three most recent starting pitcher deals with opt-out clauses were done by Casey Close of Excel Sports Management (Tanaka, Kershaw, and Zack Greinke). Greinke and Sabathia obtained the ability to opt out after three years. Boras figures to seek the same for Scherzer, who could then hit the market again ahead of his age 33 season. The opt-out clause is not a guarantee; Boras didn’t get one for Prince Fielder in the 2011-12 offseason. But it is possible that some teams won’t view an opt-out as a big negative despite the downside risk, as explained in my article on the topic from February. The clause could allow a team to sign Scherzer and duck his decline phase, as the Yankees could have done with Sabathia had they let him go after his third year with them. Getting past Tanaka’s $175MM outlay would be a symbolic win for Boras. I’m predicting a seven-year, $185MM deal for Scherzer.